The start of the National Team competition is upon us and Team USA found themselves matched up with the Canadian National squad. Out of all the teams in this tournament, the United States and Canada are the most experienced in international play and this match displayed that. From the opening kickoff, the US flexed their offensive muscles and created many goal-scoring opportunities. These offensive opportunities were in the form of free kicks, kick-ins, and corner kicks. This caused major defensive breakdowns for the Canadians, which the United States capitalized on. Most of the action in first half occurred on Team USA’s offensive side of the court. An interesting strategy that the Americans executed was having their designated goalie play up court while another member stayed in their defensive zone. This relieved a lot of pressure from the strong and weak side players, which helped them focus more on their offensive game. The second half of play was quite a completely different story. Team Canada started the second half on an offensive surge. The passing of the Canadians during the first few minutes of the second half created a lot of action to occur on USA's defensive side of the court. The US was up to the challenge and their defensive prowess neutralized Canada's offensive attack. Team USA's stout defense created a fast paced offensive counter attack. But as the American defense was strong, so to was the Canadian defense. After Canada's initial offensive attack in the second half, possession of the ball was mostly maintained by Team USA, much like the first half of play. However, unlike the first half, the second half was a defensive battle. All in all, this match was largely decided in the first half. The United States came out the gate with a strong offensive system that was too much for Team Canada to handle and overcome. At games end, Team USA claimed victory with a 6-1 score. Scoring five goals in the first half and one in the second half and Canada yielding one goal in the second half. Team USA played its second game on Friday against Brazil. The match started off fast and furious with an opening goal scored by Natalie Russo. The early goal energized the team who dominated the first half. The next goal scored was on a direct kick from JC Russo who split two defenders on a well-designed set play. The American team kept on attacking and scored another goal off a rebound by Natalie Russo. The Brazilian team quickly found themselves down three goals to none early in the first half. Ben Carpenter, who took advantage of some defensive miscues, scored the next pair of goals. JC showed off his shot accuracy by scoring on another direct kick putting Team USA up by 6. Ed McGuire, who came off the bench, scored the next three goals to end the half. Team USA did not allow a single shot on goal in the first half due to their ferocious attack and excellent defense. The Brazilian team tightened up their defense in the second half and didn't allow a single goal. The final score of this game was 10-0. This was a statement win for Team USA, proving that home-court advantage has no effect on them. The team showed its balanced attack by having multiple players scoring two or more goals. They just seemed too fast and too strong for the inexperienced Brazilian team. This dominant performance also puts other teams on notice and says that they are the team to beat. Even though the Brazilian team got beat pretty bad, they know that they will only get better from this point on. Team USA will play Uruguay next; stay tuned for more coverage. Team USA entered the match up with Uruguay as the obvious favorites. When you combine years of experience with superior equipment, the result seems pretty much a given. During these games, complacency can be the biggest enemy, but fortunately that did not seem to be a problem for the Americans. Right out of the gate, their superior passing stood out. Almost every goal came with an assist, and the young team from Uruguay simply had not seen this type of attack before. That being said, considering the amount of shots taken at them and considering that a vast majority of the game was played in their defensive zone, they fought hard and actually made a substantial number of stops. At halftime, the United States is already ahead 8-0, and the game ended with a final score of 10-0. 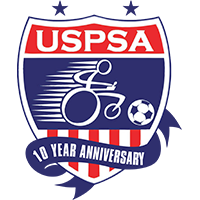 It was truly a team effort, and highlighted a lot of what has always differentiated American power soccer. Day one ended with the Americans perfect, and hopefully they can continue to ride that momentum through to a championship.